Our Travel Cravings: Five Indian Luxury train rides which cost more than a Million!! Five Indian Luxury train rides which cost more than a Million!! These luxurious Indian trains and their tariffs will definitely blow your mind! Deccan Odyssey train journey covers destinations across two Indian states of Maharashtra and Goa. The Deccan Odyssey train offers a weeklong journey which crisscrosses through the fascinating terrains of Western Ghats and the Konkan Coast. Included in the itinerary is the trip to coastal fortress town of Sindhudurg, Ajanta and Ellora rock cut caves, Tarkali Beaches and Old Goa and Vasco among others. The Golden Chariot is the only luxury train offering two train tour itineraries in South India. The itineraries are named the Pride of the South and The Splendor of the South. Whereas the Pride of the South tour itinerary covers destinations in Karnataka along with a halt the India’s most prominent beach destination Goa, the Splendor of the South Itinerary offers tours to tastefully selected destinations across South India. Destinations covered during the 8 days itinerary of the Splendor of the South aboard the Golden Chariot include Bangalore, Chennai, Pondicherry, Thanjavur, Madurai, Thiruvananthapuram, Alleppey and Kochi. Both journeys include a dash of cultural sights, World Heritage Sites, local interactions and wildlife. Train offers Eleven luxuriously furnished Air-Conditioned Saloons of 4 sleeping chambers(Cabins) each,Two Dining Cars,One Bar Lounge ,Business Centre, Mini Gymnasium & Ayurvedic Spa. 7 Nights Golden Chariot Train Tour“Pride Of South Circuit"
This train offers a 7 nights/8 days itinerary for a week long voyage across royal destinations in Rajasthan. All destinations included in the itinerary happen to be former princely states of Rajputana. The destinations covered in Palace on Wheels train itinerary are Jaipur, Ranthambore, Chittorgarh, Udaipur, Jaisalmer, Jodhpur, Bharatpur, Agra and Delhi and includes sightseeing of forts, palaces along with a dash of wildlife, heritage and cultural interactions. Pre-paid group excursions & sightseeing trips in AC buses with services of English speaking Guide & monument entrance fees. Bed Tea; Daily 3 meals (viz. breakfast, lunch & dinner)& bottled drinking water. Jungle Excursion in Ranthambhore Tiger Reserve by 15 seater open to air Canters. 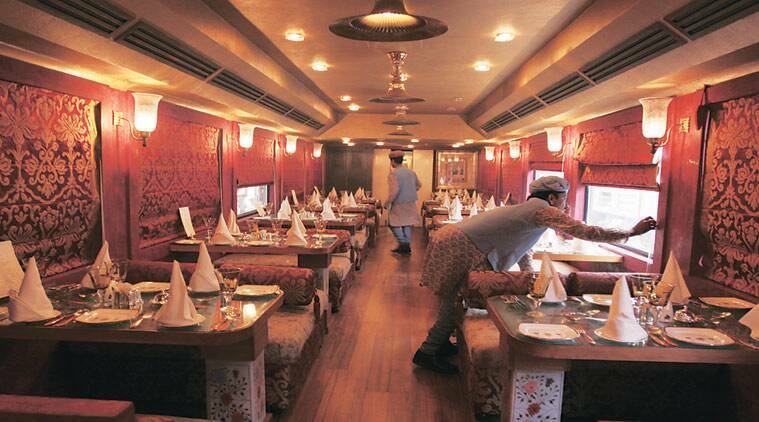 Palace on Wheels on-board restaurant! The Royal Palace on Wheels is an upgraded version of world famous Palace on Wheels. After the grand success of Palace on Wheels that is operational from last 25 years, this new train was launched in January 2009. 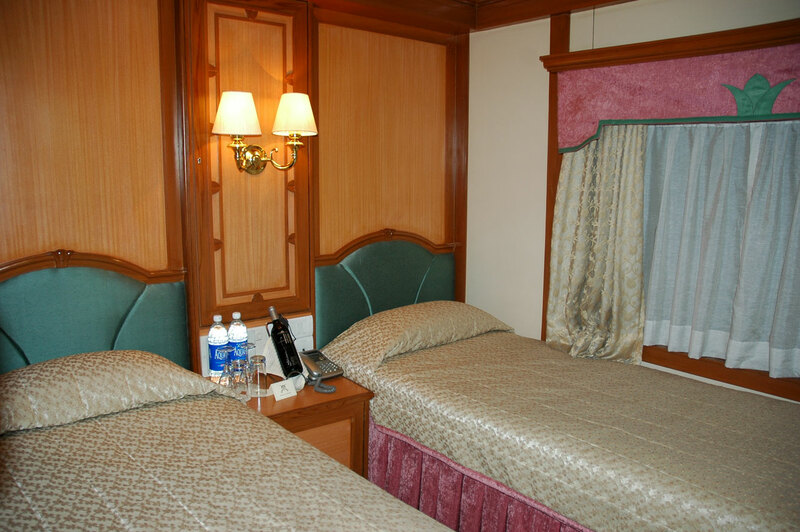 The train as compared to Palace on Wheels is much luxurious and the cabins are more spacious. It is equipped with modern amenities such as Wi-Fi internet, direct dial phones Spa and satelite television.This train offers royal rides for destinations across Rajasthan alongwith halts in Varanasi, Khajuraho and Agra. This internationally acclaimed and award winning train is perhaps the most luxurious train in the whole of Asia!. Maharajas’ Express also happens to be the latest luxury train to be introduced in India. It has created significant buzz in the global luxury travel segment owing to its state-of-the-art amenities, refined interior, intricate decor, impeccable service and technology such as pneumatic hydraulic suspension system. It is the only luxury train which offers accommodation in presidential suite spanning over an entire carriage. So when are you planning your first luxury train tour?